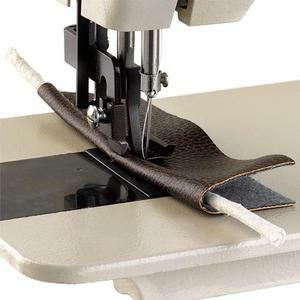 Replaces 2000u33 and Sailrite LSZ1 Portable straight Stitch, up to 5mm Zigzag Stitches, 9mm Foot Lift, 7" Arm Space, 1/8-3/16" Welt Foot, Left Zipper Foot, 150 Watts, 1.5 Amps, 110V, 800 SPM. Sewing Capacity up to 1/4" material thickness, depending on density. *Note: Full 1/4" Welting Cording Piping Foot Set is Optional under Recommended Accessories Below. The Barracuda zigzag walking foot upholstery machine is a remarkably versatile machine. The Barracuda zigzag walking foot upholstery machine is a remarkably versatile machine. 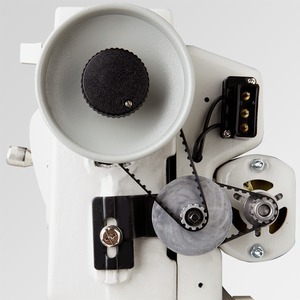 Designed for boat owners, serious hobbyists, and small businesses, the Barracuda does so much, for so little. The stitch quality is comparable to an industrial machine, for a fraction of the price... plus the added bonus of a zig-zag stitch, now that’s value! 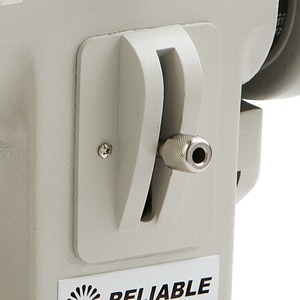 All of the convenience features are standard to make your job easier; reverse lever, oscillating shuttle hook, piping feet (1/8” > 3/16”) and of course Reliable's trusted reputation for building quality, long lasting equipment. The built-in speed reducer gives the machine extra torque to get through the toughest jobs. The inside welting foot allows you to do piping from 1/8" up to 3/16". The extra outside zipper foot is ideal for zippers. A full 1/4" clearance under the foot allows the Barracuda to sew 10 or more layers of heavy canvas or up to 8 layers of Sunbrella-Plus (top of the line material for boats). A heavy-duty carrying handle makes moving your Barracuda a simple task. The Barracuda allows you to reinforce the seams simply by pushing down the reverse lever. 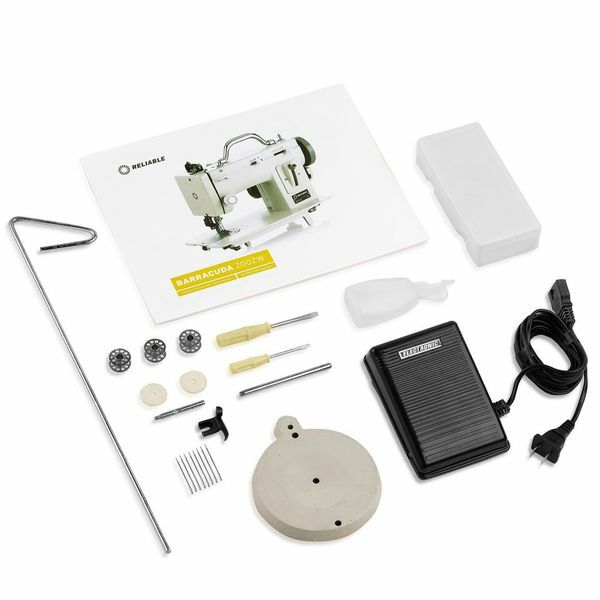 Extra needles, bobbins, foot controller, thread stand, screwdriver and an instruction book are included with the unit. Optional 1/4" Cording, Piping, Welt Foot Set (inner and outer foot) for seat covers, etc. Leave it to the folks at Reliable to come up with a full size 1/4" welting feet set for the Barracuda 2000U-33. The Barracuda 2000U-3 already is equipped with a 1/8"-3/16" welting feet set. For those jobs that need something a little bit bigger we now have you covered. Same manufacturer as Thompson PWZ500 and Tuff Sew 2000-33 but with portable handle on top. I can't seem to get the clutch engaged to stop the machine from sewing to wind a bobbin. The vertical reverse stitch lever is also an indicator, not an actual measurement of millimeters in stitch length on the fabric. The cylinder nut setting on the reverse lever is to set the stitch length limit for forward and backward stitching. It is not necessary to have the reverse stitch exactly match the forward stitch when back tacking at the end of seams. Forward stitching is done with the stitch length lever pushed down. Reverse stitching is with the stitch length lever pushed up. The more you push down, the longer the forward stitch length becomes. The more you push up, the longer the reverse stitch becomes. Zero stitch length is near the center of the slot for the vertical stitch length lever, where it stitches in place without moving (tacking). 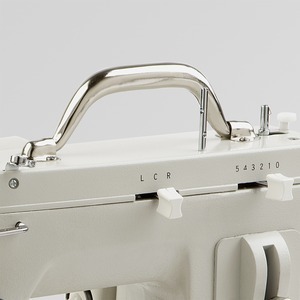 The LCR setting is for starting needle position, either all the way to the left, or center needle position, or all the way right on straight stitch setting (zero stitch width). You can even start a zigzag from the far left needle position or from the far right needle position using the LCR lever, instead of from the center where it is normally set for zigzag stitching. If you want more more top thread showing on the underside of the fabric, turn the top tension dial left or "lefty loosey" until the bobbin thread stops showing through on top (must have bobbin case and top threaded properly). If you want less top thread showing on the underside of the fabric, turn the top tension dial to the right or "righty tighty" to increase top thread tension so it will pull harder on the bobbin thread. If you adjust top tension dial too much to the left you will get loose stitches. If you turn the top tension dial too far to the right, it will pull bobbin thread up so it is showing on top. Bobbin thread should show on on the underside, but it is OK if a little top thread shows through on the underside of the fabric. Whenever you are doing just a straight stitch with the regular foot, the stitch width lever should be on zero. 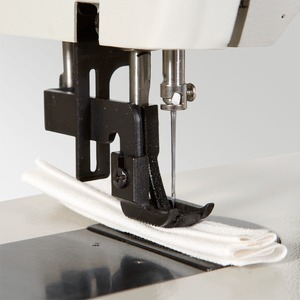 The stitch length lever can set any length up to 5mm on the fabric. Whenever you want to do a zigzag stitch as shown in your pictures, you only have to adjust the stitch width lever for narrow or wide stitching. You can lever the LCR lever in the center. Hope this information helps. Let me know if you have any questions. John Douthat, Owner & Tech. I think what helped the most was that I emailed a question ahead of my purchase and it was answered, and answered fully. Otherwise I would have had a lot of misgivings about ordering the product, since industrial sewing machines are new to me (used to home models). It made me feel confident that if I did have a problem once I got the order, then the company would help me. Now if only the machine came with a better owner's manual...but I know that's not AllBrands' fault. Sandra K.
The machine arrived in good order with all the accessories that came with it. The first thing I did was take the oil that came with the machine and oiled all the moving parts (I first had to remove the covers to access the internal area of the machine). The machine came well oiled from the factory, but I wanted to ensure that there were no areas missed. After running the machine for about 15 minutes after oiling, I placed all the covers back on and threaded the machine as per the manual. I used #80 cotton/poly thread which this machine handled with no issues what so ever. The industrial construction of this machine is impressive. It was able to tackle whatever I was able to throw at it, though there was some issue with lighter fabric as the walking foot doesn't grab and move it well. This machine is designed for heavy fabric and leather, not light fabric, so bare that in mind when considering a purchase. I was sewing with 10oz canvas and the machine worked perfect. There is a learning curve with the machine, it's not your run of the mill singer or brother machine; it will take some time to get use to it's bulk and the strength of the motor. But once you overcome that learning curve, it will serve you well. The only issue I have experienced with this machine is that when you are attempting to transition from 2 to 4 layers of canvas (Turning on a hem) You have to move slow and lift the pressure foot to ensure that the 4 layer hem doesn't get pushed out of the way because of the movement of the walking foot. I expected that transition to be a little better, but that was the only issue I have experienced so far. I know their are a number of companies who are currently using this platform (Thompson), some are better, some are worse. 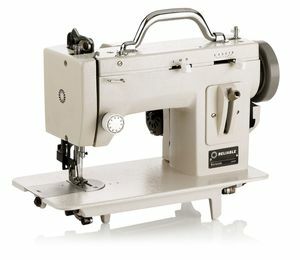 In my opinion, Reliable has a good solid machine here that will serve anyone well who sews heavy fabric or leather and is in need of a machine that is both industrial and portable. I have struggled with this machine on and off for a year. Whatever it takes to make it run properly is not present upon arrival, and definitely not present in the crudely drawn (literally) manual. The customer service is less than enthusiastic. I purchased a new computerized Brother for $100 around the same time for my "light duty" machine and have accomplished so much more. Perhaps the SailRite version of this is better. This one is certainly not worth the discount. Our new Barracuda™ 2000U-33 is the toughest little machine you can imagine. Boat owners, hobbyists and small businesses can all receive the benefit of the Barracuda™ design and build quality. While every machine has its limits, we are always amazed at how far we can push the Barracuda. While sewing some rope the other day, with a small adjustment, we were able to get a foot lift of 14 mm… pretty impressive. The Barracuda™ 2000U-33 has a retail price of $499.00, and is in stock and available for immediate delivery. I just want to add that I thought part of the extension table for the Reliable sewing I bought was missing. I contacted your customer service and Jennie did an excellent job helping me. She gave me the contact name for Reliable. They were also very good to work with-even after I called them back to explain the missing part was 'hiding' on my sewing table. So, so far, I would say that I am a satisfied customer. I will most definitly be shopping with your company again. Size Please Choose 1" 1 1/8" 1 1/4" 1 1/2" 1 3/4" 2"
Consew CP206R Portable Straight Stitch Sewing Machine, Walking Foot, Choose 7 or 9" Arm Space, 110V or 220V Motor Installed, Hard Carrying Case Incl.